An electric motor installed with all the pre-commissioning checks sometimes gives a trouble. Sometimes an accident happens to your electric motor and it needs to give attention before using it again. This is a common engineering practice. If any water or any moisture observed in an electric motor, it should be dried out. This will ensure the safe running of a motor as well as Air Compressor. Various methods are available for “Drying Out” electric motor. But you will get here the methods which are possible for practical use. In every plant, all the facilities are not available at the same time. So, it is very important to use the method which is most suitable at that moment. You can use any method from below. 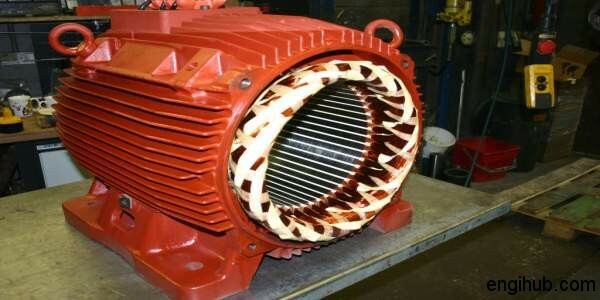 01) A convenient method of drying out the electric motor is to block the motor. So that it cannot rotate and apply a very low voltage. It should be about 10% of the normal to the starter terminals. In the case of Slip ring Motor, the rotor windings should be short-circuited. Close supervision is necessary during the process of “Drying Out” with this method. The heat generated in the windings is not easily dissipated and one part of the winding may be exceedingly hot before another part has had time to expel the moisture. This may be deviated to some extent by taking every precaution to exclude draughts from exposed parts of windings. 02) The electric motor which is used to run Air Compressor can be placed in an oven, if available, but the temperature shall not be allowed to exceed 85-degree centigrade. Alternatively, hot air can be blown into the motor. The air must be clean & dry at a temperature not more than 85-degree centigrade. 03) The electric motor can be dried out by placing 6 to 12 carbon filament lamps closer around the frame of a motor. Properly hung to the fixtures for more than 24 hours under observation. 04) By applying DC Current (Not more than 80 % of the motor rated current) continuously to the stator of the motor, the large motor can be dried out. While the motor is in drying out process, the small vents, if provided, on both the sides of a motor should be kept open for an escape of moisture. A tested temperature gauge (capillary type) should be placed on the motor to record the optimum temperature the windings achieved. Hence to control the temperature to below85 degree centigrade. It is necessary to cover the motor with asbestos clothing to prevent heat radiation. Insulation resistance must be measured at an interval of every hour till the insulation value stabilizes at a certain point. Then after the heating process is to be discontinued.